As an organization that receives resumes nearly every single day from safety “professionals” seeking new opportunities, one might think that the selection process must be daunting. Fully assessing the appropriate knowledge, skills and experience necessary to perform the core functions of what safety professionals do doesn’t take place in one meeting or one phone interview. It is a multi-tiered process that ensures that only the best candidates are even considered. Credentials – There are a wide number of credentials in the Safety, Health, Environmental, and Loss Prevention world. We prefer (and promote) credentials awarded through the Board of Certified Safety Professionals (BCSP). The BCSP is the gold standard in safety certifications and means the credential holder has met rigorous educational, experience and examination requirements. Secondary consideration is given to credentials issued purely through attendance of a course and successful passing of a quiz, CSST, OSHA 500/501, COSS, etc. It should also be noted that although credentials are important, if a candidate has three of more acronyms after their name, this may be a sign of trying to overcompensate for the lack of skills in other areas. Integrity – We value honestly. Often, our word is all we have in Safety. However, when vetting quality candidates, we don’t take everything at face value. We see people lie on their resume all too often, unfortunately. This is why we pay a service to verify degrees. This is why we contact past employers and verify dates of employment as well as if they’re eligible for rehire. The safety community is not that big here. Chances are if one doesn’t carry integrity, their reputation will be known. Professionalism – In our organization, professionalism is not only judged by one’s work product and how well they communicate, but also in areas of association. 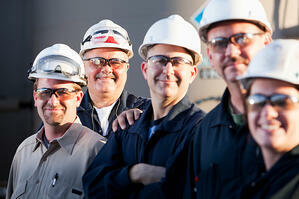 Every person on our team is a member of the American Society of Safety Engineers (ASSE). The ASSE is the oldest and largest safety society in the country. Our team members are not just members, but they also serve in leadership positions in local and regional levels. Any candidate who isn’t a member of the ASSE is not given preference. Education – Degrees in Safety are always preferred in our organization, particular from ABET accredited programs, but not absolutely required. Our selection process is not limited to degrees in OSHE, but can also include short educational courses, development workshops, and other ongoing training. However, it is important that safety professionals are continuously seeking out new knowledge to keep their skills sharp. Stating that you went to a conference 5 years ago on your resume doesn’t impress anyone. In addition, we often hear people say that they don’t pursue further education because their employer won’t pay for it. In my opinion, if you’re not committed to learning everything you can about your chosen career, regardless of who pays for it, then you’re not really serious about your career. Experience – When evaluating a safety professional’s work experience, we look at the amount of time they’ve spent with previous employers. For those who work primarily on projects, multiple employers can be expected. However, if the candidate has multiple positions in management over a short period of time, this may present a red flag. We also make certain that the experience that the candidate states, can be backed up with examples. In cases for project staffing, we take the same level of care as when hiring full time members of our team. Passion for Safety – Last, but certainly not least, we look for the “Why” in all of our candidates. We ask, “Why did you choose to go into safety?” We get their answer and then ask, “Why is that reason important to you?” Those who just want a job are rarely given consideration. We look for people who are driven by a higher purpose. There are other steps within our hiring process that includes critiquing resumes and multiple interviews by all team members.